made from leftover bits and pieces. Me,too. Though I am not convinced of their intelligence, I am certainly a beliver in their beauty. 🙂 Sweet granny square shopping bags. Hello, love the cute poem. Your market bags are beautiful. Happy Monday, enjoy your day and new week ahead! I love the stars too and the poem. Now, if I had a market bag like that I would love to go shopping and I would feel pretty snazzy too. What a great idea for the little bits of leftovers. I LOVE your market bags! !♥ And stars .. I love those market bags! They remind me of the beautiful afghans one of my neighbors would make when I would growing up. She gifted them to everyone...so gorgeous!! Have a great one! Love and hugs! I like the poem and will write it in my journal today! And the bags are lovely! How talented you are! Enjoy your day sweet friend. Hugs! I love stars too AMalia, sendyou love and hugs! Those bags are a real delight. These are wonderful! I do LOVE granny squares! Have a great week. I love your market bags! I hope they do get filled with dreams! Amalia, these market bags are adorable and the poem is delightful! you hope and dream will be come true...amen. loving your market bags. I love starry nights too. Winter brings crisp, dark, skies for star gazing. Love your poem Amalia; starry skies have always fascinated humans. It’s quite magical. Your new market bags look wonderful. I was a teenager in the 1960s and many people who could crochet would make bags, vests, hats etc...all so cheerful! I also love the bags - are they lined? I love stars, too, and your pretty bags! Great job!Amazing bags and poem!Hugs! Isn't it wonderful what scraps can make? They're so pretty! And I love your poem, too. Thanks for coming over to the Gypsy the other day! lovely bags and such a sweet poem. Twinkling stars are so magical. Lovely totes and I love the stars too. We are just about to the first day of Winter here. On clear nights the sky is so lovely. We can see the big dipper and little dipper and the milky way and so many more. The sky just seems to be brighter on Winter nights with the snow reflecting the stars. Your market bags are fantastic Amalia! What fun to take these to the market! Lovely poem and those bags are really neat. Thanks! Beautiful poem! I love to lay on the ground looking at the stars on the sky. It seems I'm on space! Isn't the theatre of the night sky with all those twinkling stars a most wonderful thing. 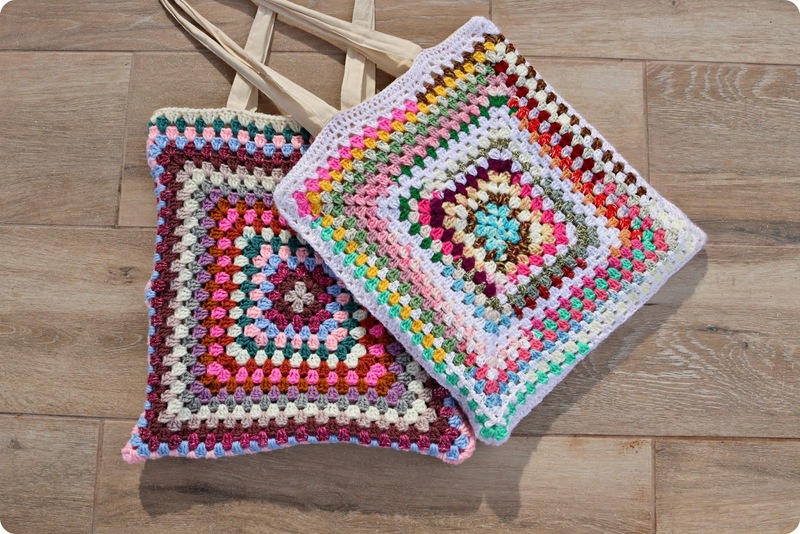 Your crochet bags are so pretty, Amalia. You did a beautiful job with those bags using just leftovers! Love it. Beautiful bags. Good way to use even the smallest scraps of yarn. Lindos, adorei as cores. Obrigada por compartilhar um dica tão preciosa. Feliz natal e um ano novo cheio de alegrias e felicidades. A good old granny square is still hard to beat. Lovely sparkly colour combinations. I like the look of your cheery market bags. I'm forever misplacing mine. A clever (and beautiful) use of the bits and pieces. And thanks for doing your part to protect our environment! Your sweet bags remind me of vests my older sisters wore in the 70's. So charming! May you have a wonderfully blessed holiday season. Votos de Feliz Natal repleto de muita paz e amor. Belas sacolas! e ecológicas, coloridas e alegres! Tenha um bom e santo natal! Hug! What fabulous bags... and once again, such a sweet poem! Mi madre le gustaba mucho y también hacía preciosidades. Amalia, these crocheted market bags are beautiful. The leftover pieces of yarn make such beautiful and unique projects. Merry Christmas! Thanks for your kinds words on my posts 2018. Beautiful market bags, fantastic colors!! Great use of your leftover! Your market bags are lovely! I made a crocheted bag back in the 70’s but didn’t see the point in lining it ...... of course it wasn’t much used! Now if I look in the Dreaded Cupboard it could well be lurking somewhere there, and now I would line it! We've had such a run of cloudy days and nights, I hope to see the stars this weekend! Love the star, the bags and your blog! I love your poem and I feel an affinity with the stars. When my family were still in France and we were so far apart, I was comforted by the knowledge that we see the same stars! In fact I was wrong as the Southern Hemisphere night sky is very different to the Northern Hemisphere! Your bags are lovely! Wonderful poetry, too.